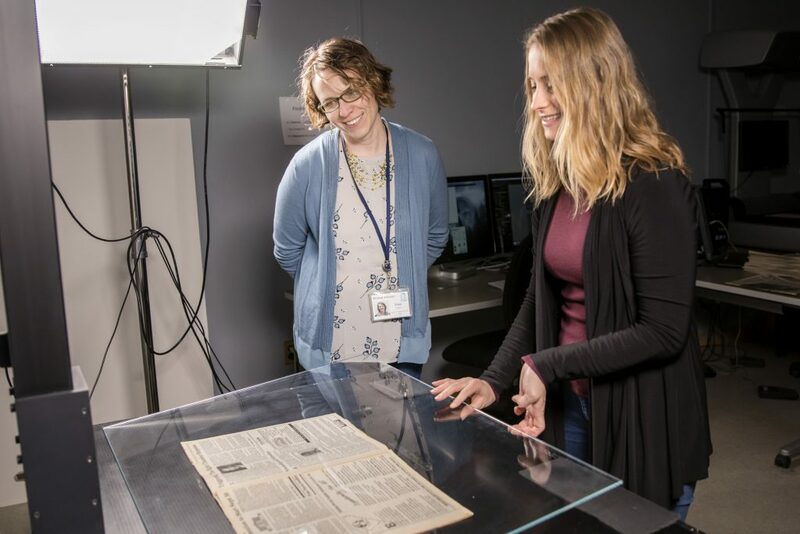 As the North Carolina Digital Heritage Center (NCDHC) at the University Libraries prepares to celebrate a decade of community engagement, it has received a grant for nearly half a million dollars to extend its operations. The $467,384 grant comes from the State Library of North Carolina with funds from the Institute of Museum and Library Services. A partnership between the University Libraries and the State Library established the NCDHC in 2009 to promote learning by increasing open access to North Carolina’s historical and cultural heritage. The center partners with libraries, museums, archives and cultural institutions around the state to digitize items from their collections and make them freely available online. Lisa Gregory, program coordinator for the NCDHC, says the center will allow staff to travel to other locations in North Carolina for on-site scanning trips and consulting visits. Since it opened, the center has digitized more than 160,000 pieces representing North Carolina culture. Materials come from 232 contributing partners in 81 of the state’s 100 counties. Earlier this year, it was a finalist for the 2018 National Medal for Museum and Library Service. Gregory says she believes this Library Services and Technology Act (LSTA) grant will help the NCDHC continue to fulfill its mission.